7. Decide how you will embellish. If you want ribbon that goes through two holes like I did, measure and mark where your holes should go. 8. 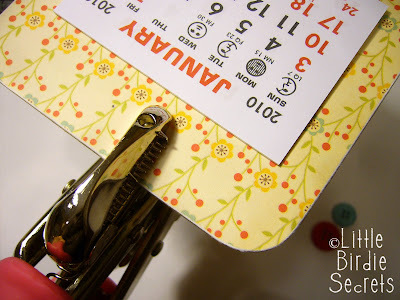 Use a Crop-A-Dile to punch holes through your chipboard and paper. 9. Thread ribbon through and either tie in a double know or thread down, cross in back, and come back through holes on front. 10. Adhere buttons or other embellishments. 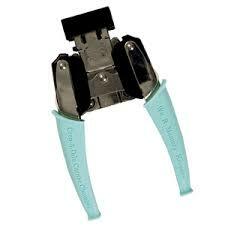 I like Tacky Tape or Glue Dots for a strong hold. 11. 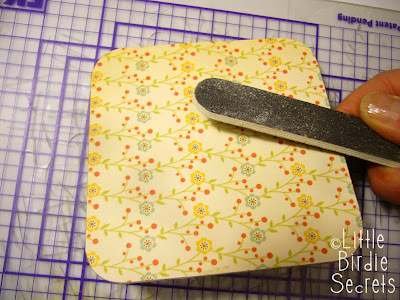 Glue a magnet to the back. Done! Wrape in a cello bag for gifting! 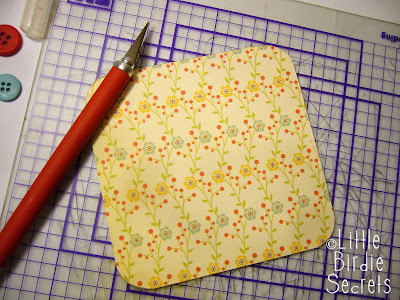 I have had so much fun using my different 6x6 paper pads for these magnets. This is a great teacher gift, too! If you know someone like I do that has a stainless steel fridge (which means no magnets), you can always add a little piece of chipboard to the back so it will stand up on a desk instead. Very simple and fun idea! Those are the cutest things ever! You are a creative genius! Great idea! Love the papers - can see how you could get carried away! Sooo cute! 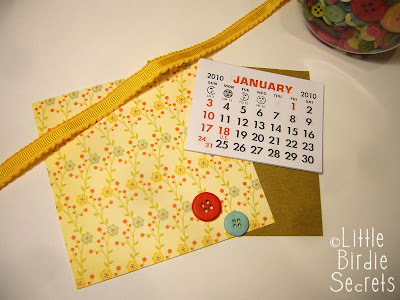 You bet I'll be bookmarking these to make for next year (a great gift for my co-workers). Thank you so much for sharing! Too cute and looks so simple. I want to try this!! very simple and fun. 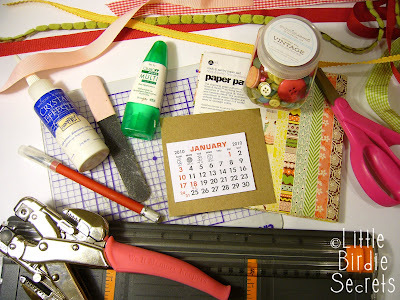 I've been reading your blog lately and thought I would post that you guys have fabulous projects. Thank you, they help out another crafty mother here in the Northwest. I have just found this blog and it's fantastic. I feel I can get stuck in to quite a few of these. I love this idea. soooo cute, thanks! What a super, cute idea! Love it! Great Idea! 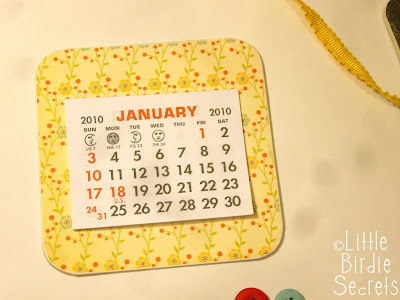 Depending on the size of your calendar, you could also use resturaunt coasters and create something similar to the post-it clip board found on my blog. 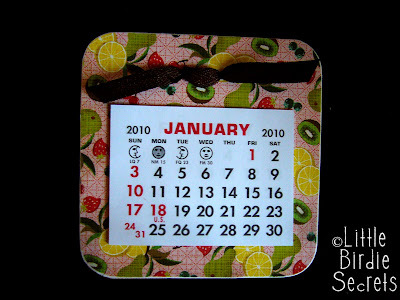 Do the clip board and the calendar in coordinating papers for a great gift for co-workers! Thanks for all your great ideas. Your amazing! Such a cute idea - and so versatile! Oh my gosh I want to eat that strawberry one, it's so cute! Oh and what size calendars did you buy? I'm thinking medium but they're all sold out at blueskypink. 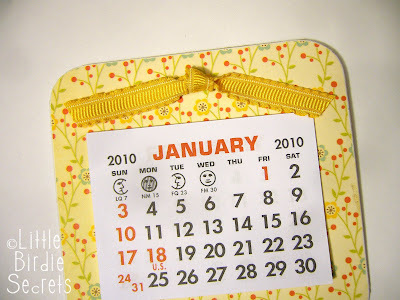 Must be a lot of people making cute calendar gifts this year!! We actually bought the large size which measures about 3 x 2 1/2 inches. I love all your wonderful ideas on your Blog. I am now following and can't wait to browse through your other posts! Thank you so much for sharing all your wonderful ideas and sites with everyone. LOVE THOSE!!! I am making those for sure - did I mention I love them? Thank you so much! Great idea! In fact I just finished making one for my kids teacher! I posted about it on my blog and linked back to you. I love your blog and all your creative ideas. thanks for sharing!! SOOOO cute! I'm going to try this! These are so cute!! I featured them, with a link, on my blog at www.ascrapoftime.wordpress.com. Love them! Great idea for a gift for the girls at work. Thanks for sharing. This is so cute! 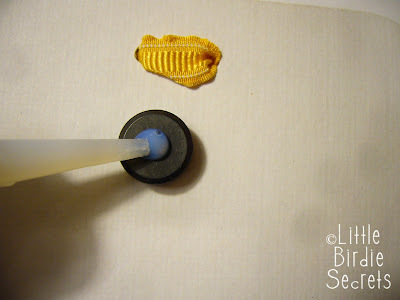 I am linking this tutorial to our blog ziggycrafts.blogspot.com Thanks for sharing! 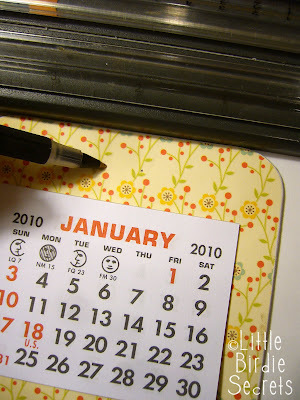 I love this calendars!! 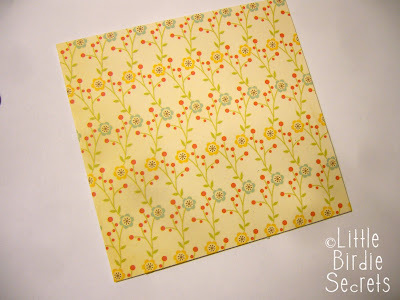 Beautiful papers you used! Could you post a link to where your calendar components came from? I can't seem to find them on that website.